What can be more fairy-tale then Christmas in a ski resort? Spending Christmas in a picture postcard wood chalet covered in snow with a large roaring open fire united with all the family is idyllic. Combine that with it being situated in a welcoming lively town full of Christmas spirit & twinkling fairy lights. Best of all having Private Chefs who look after all of the festive food & drinks takes the pressure off the whole family. Christmas is the perfect time to indulge in a little Luxury & hire a SpoonyCooks Private Chef. At SpoonyCooks we have it all covered! 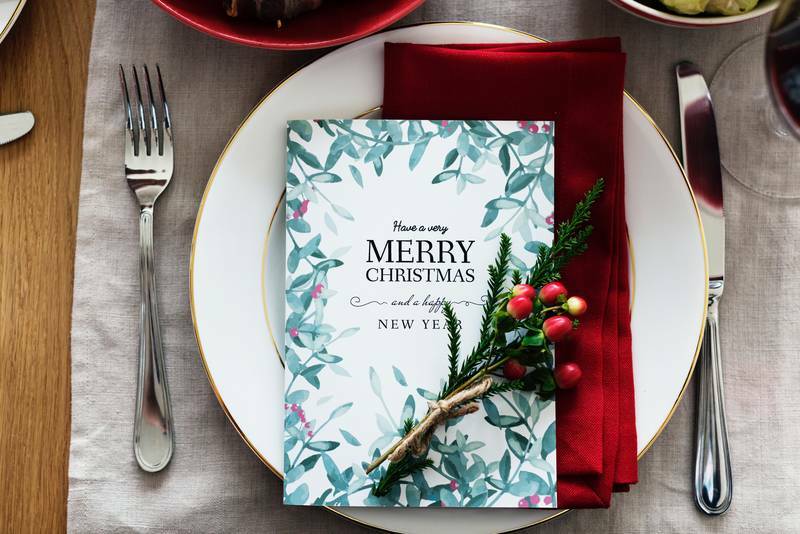 We provide an exceptional Christmas Menu including bucks fizz breakfast, minced pies, champagne punch, traditional 5 course Christmas dinner & fine wine. All the Chefs at SpoonyCooks just loves Christmas; we arrange a themed table complete with crackers, sparklers, Christmas hats & most of all bring festive hospitality! Your Family can enjoy this along with a full week of fine dining, fine wine, freshly baked cakes & hot cooked breakfasts for less than £56 per person per day & Children’s menus significantly cheaper…. Christmas just got a whole lot better! On top of all that… Morzine, Avoriaz & Les Gets know exactly how to host the perfect Christmas with giant ornamented trees, twinkling fairy lights, Christmas villages, Elves & Santa. They offer a fantastic atmosphere & boy they sure know how to put on a show! Last year in 2017 the snow conditions were incredible for Christmas! Les Gets had snow depths up to 132cm, Morzine 170cm & Avoriaz a staggering 190cm the snow started to fall late November & kept coming most of December, the sun came out like a present from Santa on Christmas day & we all enjoyed white fluffy snow with the perfect blue skies. Skiing & snowboarding was a dream & a midday, Vin Chaud on the mountain was true pleasure! Snow parks were already formed & Santa was on the slopes having fun after his busy night delivering presents. No matter what the conditions are like, if you ski or not; Morzine, Avoriaz & Les Gets have a festive program like no other! Christmas Parade - Involving flamethrowers! No One Needs to Miss Out!! No one needs to miss out on all of the magic these ski towns have to offer or miss the excitement on the children’s faces. Because your SpoonyCooks Private Chef will be taking care of stuffing the turkey, prepping the sprouts, wrapping the sausages & beating the brandy butter. You can all sit back & indulge in a well-deserved Christmas film in front of the open fire while we wash all the dishes & clear the table… sounds like bliss! All the SpoonyCooks Chefs will have a full up to date itinerary of what’s going on this Christmas in your chosen resort & ensure you don’t miss all the fun! For the adults and larger ‘kids’, the fun really gets going in these Port du Soile resorts with Morzine hosting some of the biggest Christmas Eve party’s in the Alps. There is always an amazing Christmas Après from Happy Hours with live music, turkey baps & Christmas jumper competitions its one not to miss… Bar Robinson, Dixies, the Cavan Bar, & Tibetan Café continuing the party with the finally mega party over at Café Chaud, with last year welcoming the arrival of Santa with shots of Jager! Between all the partying your SpoonyCooks chef can ensure you have a stress-free Christmas dinner & keep you going with Champaign Punch & fine wine. Happy Hours is renowned for hosting some great adult fun on Boxing Day, Last year hosting the Santa Crawls & Eskimo Ball. Stay tuned & we will keep you updated with all the activities as there announced for this Christmas 2018 but we're sure it will be bigger & better than last year!